Giving myself a rest from trying to figure out why George Cockram changed his name to Thomas Smith, I'll get back to wondering why he left England. Of course the answer to those two questions could be one and the same - but for the time being, I'm going to assume that he wasn't running away from anything, he was just looking for a better life. 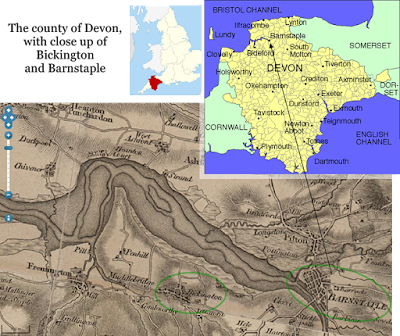 So what might George's life have been like in mid 19th century Devon? Let's start with his childhood. 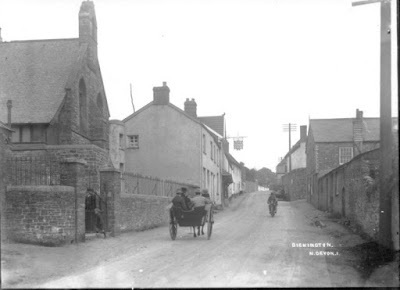 George was born in 1851 and grew up in northern Devon, in a little village of around 300 people called Bickington. 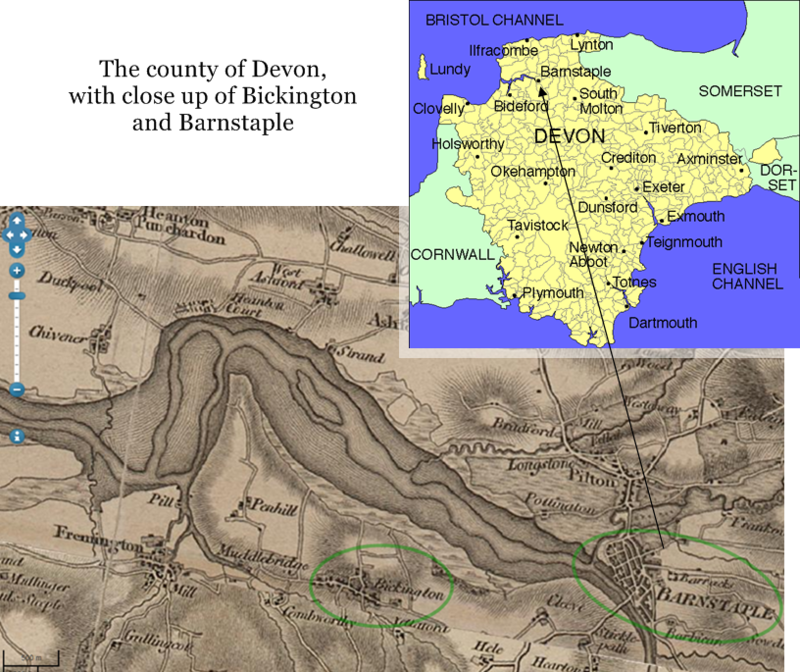 The nearest town was Barnstaple, about two miles away, with a population of about 11,000. This was in the Victorian age, which saw the industrial revolution radically change the landscape and the living and working conditions of English people. Industrialisation brought with it new jobs, a consumer boom, a shift from a mainly rural to a mainly urban population and greater prosperity for most of the propertied classes. But George and his family weren't among the propertied classes - they were rural labourers. His father, and siblings as each of them came to their early teens, worked as farm labourers or domestic servants, and George may have done the same. And for the first half of the 19th century the rural and urban poor had much in common: unsanitary and overcrowded housing, low wages, poor diet, insecure employment and the dreaded effects of sickness and old age. Life expectancy at birth was only around 40 when George was born. I think the Cockrams were not exactly poor, but father William's labouring wages would have had to feed quite a few mouths before any of the children were old enough to go to work. In the mid 1860s, he would have earned around 10 to 12 shillings a week (25 to 40 pounds a year, at a time when a man was considered a gentleman if he earned more than 150 pounds a year), and being a farm labourer, he wasn't guaranteed work all year round. He may have supplemented his income with other forms of work in the winter. The family home, which was a rented cottage, was probably made of cob - unbaked clay with organic material to bind it. This form of building, often with a thatched roof, was very common up to the late Victorian period, particularly in northern Devon, where the soil was suitable. 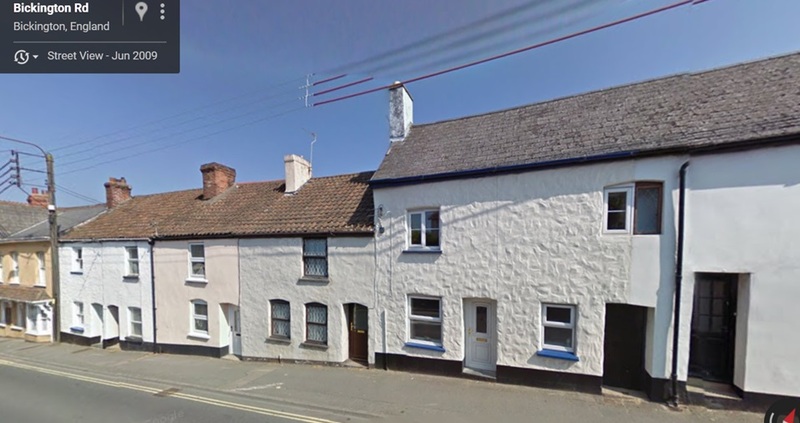 These were durable houses if plastered over and damp proofed top and bottom, and many of them still stand. somewhere right around here - possibly in one of these houses. "The general sanitary condition of the village was very bad. Picturesque as they were externally, many of the peasant's cottages were unfit for the housing of pigs. Pools of stagnant water stood in many parts of the parish....The whole village was badly drained, open sewers ran through it frequently trickling down upon the cottages into the village brook, from which cattle slaked their thirst and the villagers and their children often drank." 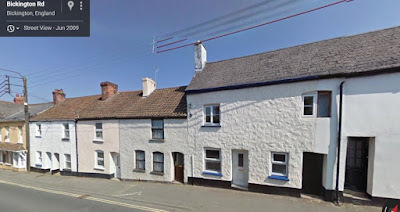 The house would have had only one sink, in a tiny scullery, and there was probably a communal toilet somewhere out back, shared by several cottages. Water would have had to be fetched each day, either from a village pump or well. Right up until the end of the century, it was common for rural houses to be lit by rushlights (rush plants dipped in fat), or candles, which were expensive. Heat would come from the fireplace, which was also used for cooking. In the early 19th century the working class lived on plain food such as bread, butter, potatoes and bacon. Butcher's meat was a luxury. However the diet of ordinary people greatly improved in the later part of the century. Railways and steamships made it possible to import cheap grain from North America so bread became cheaper. Commercial refrigeration made it possible to import cheap meat from Argentina and Australia. Consumption of sugar also increased. By the end of the century most people (not all) were eating a much better diet. Most cottagers kept a pig or pigs, and if they were not eating ham, sausage, bacon and lard from the pig, they were eating a diet, the scraps of which would feed the pig well and fatten him up before slaughter. "Most rural people didn't have coal-fired ranges or access to gas, so cooking was generally done in the fireplace. A big iron boiler was slung on a hook over the fire, and everything was cooked in the one utensil; the square of bacon... cabbage or other greens in a net, potatoes in another, and the roly-poly swathed in a cloth. The water in which the food was cooked, and the potato parings and other vegetable trimmings were the pig's share." Schooling was not compulsory for children until 1880, and then, only for 5 to 10 year olds - neither was it free, except for the children of the destitute. Nevertheless, George and all of his siblings went to school, which is an indication that their father wasn't doing too badly. When George was a child, there was no purpose-built school in Bickington, so the children had their lessons in an old barn. By 1868 there were about a hundred children attending school there - it was time that a proper school was built. A bazaar was held to help raise funds for it, and by 1870, a fine stone school had been built. George's youngest siblings would have attended it, but George himself had all of his schooling in a barn. This undated photo, showing the stone school on the left, is probably from the early 20th century. The building next to the school was, and still is a pub. Just beyond that are the cob cottages in the photo above. Outside of school, he would have had chores to do, which probably included foraging for mushrooms, nuts, apples, berries and whatever other wild food was in season. He may have had to fetch water from the well, or milk from the dairy, or bread from the baker, or if his mother baked her own bread, George may have joined her and and his siblings in 'leazing' - combing the harvested fields for missed grain. After two or three weeks of leazing, the collected grain would be thrashed at home and sent to the miller for grinding into flour. A rural child's leisure hours were probably very few, but when there was time for play, popular pastimes included hoop-rolling, skittles, and kicking a ball around, or in the absence of a proper football, a pig's bladder would do. On Sundays, nearly everybody went to the parish church, which was the focal point of village social life. One effect of the industrial revolution was the drawing of a great many people from rural areas into the towns and cities, where jobs could be got in factories or dockyards. At some point, George was drawn away from Bickington, to Plymouth in southern Devon. Exactly when he went there and why, I don't know, but soon I'll follow him there to see what his city life might have been like.